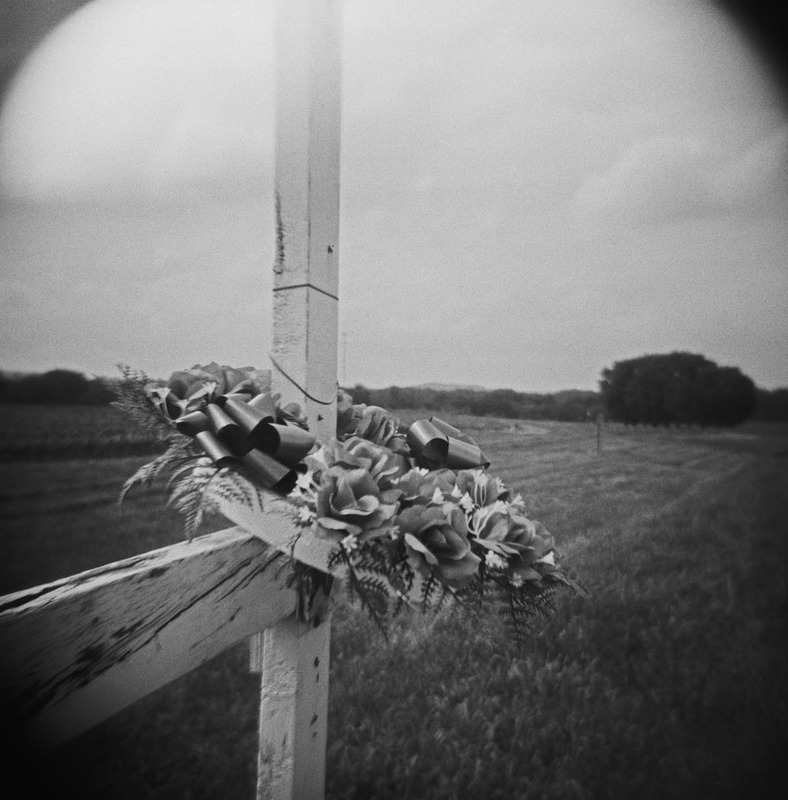 I do not question why I shoot roadside memorials. I have often said that I am haunted by all the photographs I didn't take. I got the idea to shoot these subjects while working on a long-term writing project in Greenville, Texas. Several times during the gig, I would leave the work site as the sun was setting. Just outside the facility's fence was an elaborate memorial, well-kept and very Catholic/Hispanic in tone. The combination of the sun's last rays of that orbit and the macabre statement of "Someone died here!" is perfectly painted in my mind. If I had had a camera with me, perhaps I would have photographed this perfect memorial and never shot another. I don't have much else to say about this series, other than to say I initially wanted to call is Road Kill, but decided against such poor taste. I hope the work speaks for itself. I will add, however, this cautionary advice. If you think you, too, would like to document these makeshift cemeteries, be aware that there's probably a good physical reason why someone died in an accident in a particular bend in the road. Trucks going by have pulled me into their drafts, tires have sprayed me with gravel, and the sight of some weird dude with a camera on the side of the road have all almost made me a casualty. And this too: On many occasions I have stopped to make my photograph, only to drive by some time later to see that the memorial was gone. One was even in pieces, cut down by a highway department brush hog. Just another temporary altar on that bittersweet route.